Stay Smart at Our Cheney HotelYou'll find the comfort and convenience you need at our Holiday Inn Express Cheney, WA hotel, one of the leading hotels near the Spokane International Airport. Our hotel's located at the corner of Betz Rd and Hwy 904, minutes from the Eastern Washington University and near many businesses and attractions. 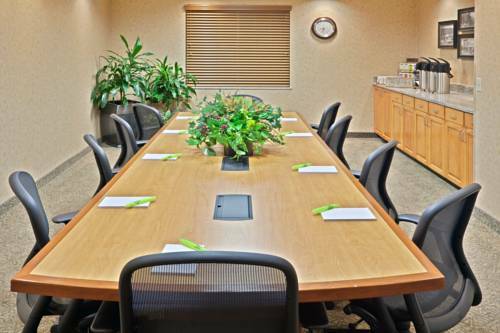 We have reasonable rates and a name you can trust.Thoughtfully designed for the most distinguished business traveler, our hotel has free Wi-Fi access, a 24-hour Business Center, and 2000 sq ft of banquet space. With a location near Fairchild Air Force Base, Triumph Composite Systems and BF Goodrich, the Holiday Inn Express Cheney, WA is the best place to stay near the Spokane International Airport.Our hotel's perfect for families as we are close to many area attractions including the Turnbull Wildlife Refuge & the John A. Finch Arboretum. Spend a day golfing at Fairways Golf Course or cheering on the Eagles at an Eastern Washington University football game. We offer an array of complimentary amenities to guarantee an amazing stay including: a complimentary shuttle within a 7 mile radius, a hot breakfast bar buffet, 24-hour fitness center, and indoor heated pool and spa. You'll find quality, contemporary accommodations when staying with us, so make your reservation today at our Holiday Inn Express Cheney, WA hotel! Childrens's program - Stop by our front desk and check out a board game! We have several to choose from, from Candy Land and Sorry! to Monopoly and checkers. Sweet Pea BoutiqueOur focus is pre-loved clothing and shoes at reasonable prices, refinished furniture and local, handmade soaps, lotions and ointments. We will be carrying organic European wooden toys as well. AMTRAK-SPKAmtrak train station Spokane, WA has an enclosed waiting area, without Wi-Fi, with parking, with accessible platform and wheelchair available. Fairways Golf CourseThe Fairways Golf Course is a 18-hole golf course with dining facilities. The golf course features a mix of challenging holes that offer subtle undulations and elevation changes as it meanders through a series of natural wetlands and native-grasses. Turnbull National Wildlife RefugeLocated in the backyard of Cheney, Turnbull Wildlife refuge is open from March 1 through October 31 from dawn until dusk. Turnbull has a variety of outdoor activities for you and your family with dozens of species to observe in their national habitat. Eastern Washington UniversityOur Cheney, WA hotel's location is only two miles from Eastern Washington University. Take a tour of the 300 acre campus, established in 1882. Student tour guides can show you the academic buildings, residential halls and the athletic facilities.